And breathe. Another week of talking weddings, weddings, weddings... I love it but it's exhausting as I get swept up in the bride's excitement every time they come in. A chamomile tea is in order after every consultation to bring me down from the wedding flower high. I just love tapping into the vision of a bride and get a real buzz out of making the bride giddy about her big day!! And so to this weekend's bride. Well I was just blown away by Julie, the French macrame master. I shouldn't have expected any less from her really. Set in the super cool 99 Mary St, with its exposed brick walls & industrial furnishing, Julie created a gorgeously fresh but uber cool environment to celebrate their new commitment to each other; the palette perfect for early May with whites, yellows & greens. On entry I was blown away my the magical geometric diamonds hung from the ceiling. Julie told me they were so simple to make but they looked very impressive. Then your eye is drawn to the handmade wooden & copper geometric candleholders (made by the groom), handmade menus printed onto Kraft card, and yellow geometric napkins. 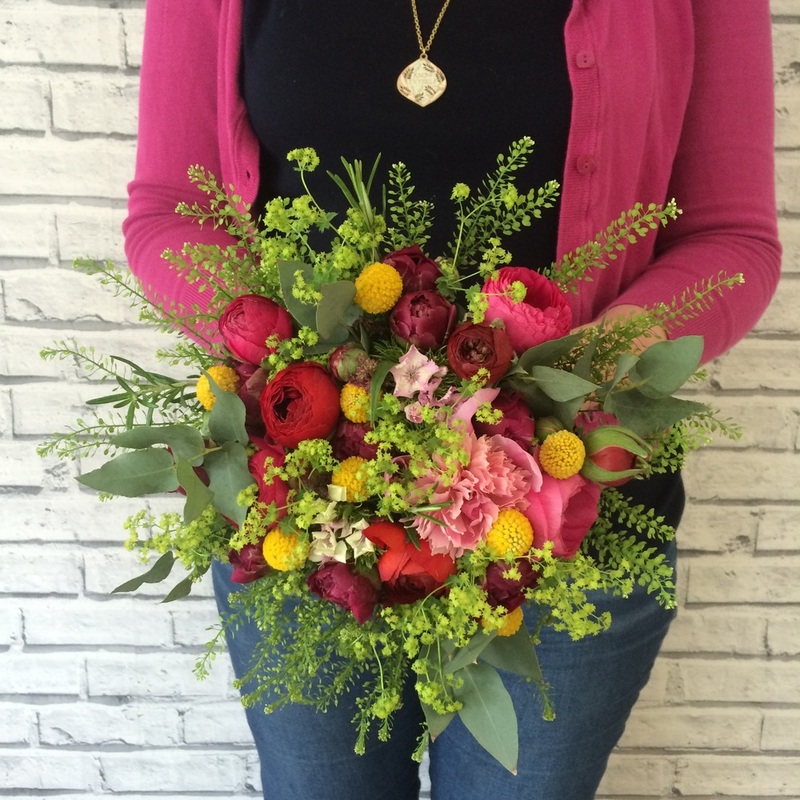 Florals wise, Julie asked for a rounded wispy bouquet in fuschia pink, red, bright green and of course yellow. For this, I spent the few days before teasing out the peonies - leaving them in sunny windows and even massaging them to their full glory. The buttonholes were a joy to make - wired mini succulents, yellow Craspedia, Rosemary & eucalyptus. For the tables, Ferns, Eucalyptus, Rosemary & Craspedia were sprinkled into brown chemistry bottles. 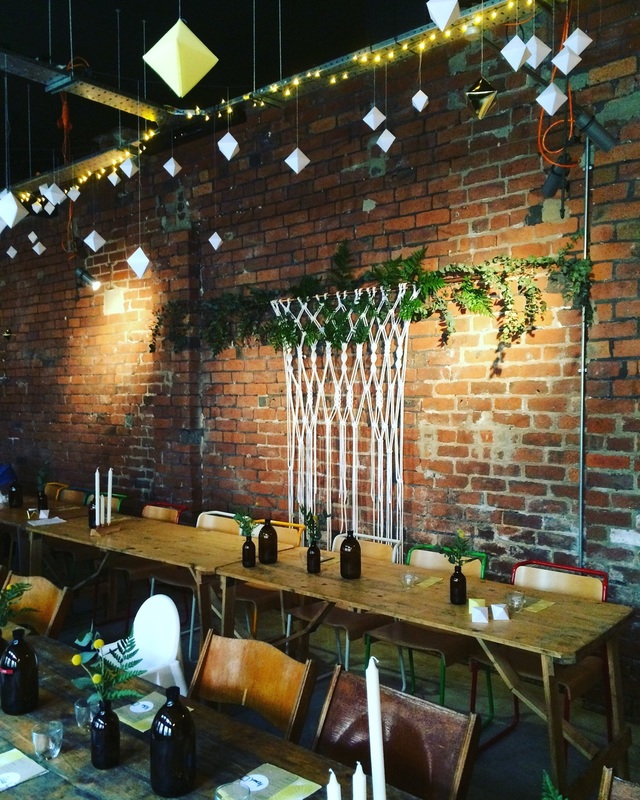 The star of the show in my opinion though, was Julie's amazing giant macrame wall hanging - it looked stunning against the exposed brick. I was both honoured & extremely excited that Julie asked me to decorate this hanging with Ferns & Eucalyptus. Perfect.